Location: Situated in Nolton village, on N side of road. Medieval church with C15 porch near identical to that at Roch, both churches having been granted by the de Rupe or de Roche family to Pill Priory, Milford. Much restored in 1876-7 by E.H. Lingen Barker. A roof truss dated 1794 was removed in the restoration. The restoration cost £411. The old walls were kept, except S wall of porch and part of E end wall. A new vestry was added on NW using the old N door. All the windows were replaced with stone tracery, having been sashes, and the bellcote was rebuilt, supposedly as before. The roofs were rebuilt to a steeper pitch and the interior was refitted, retaining the font and monuments. Sir Stephen Glynne visiting in 1851 noted a pointed W door, a W end stone bench and a 2-light E window with internal shafting, and also indicates that the wall brackets were then below niches. Church, rubble stone and slate roofs with white terracotta ridge tiles and terracotta cross finials (by Johnsons of Burgess Hill). 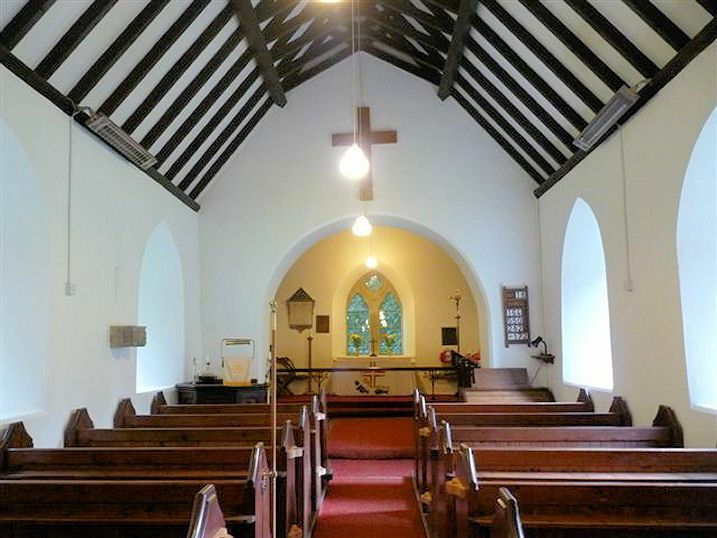 Nave and chancel with S porch and W bellcote. Battered windowless W wall with C19 bellcote, 2 openings, coped gable and cross finial. S porch with plain chamfered pointed arch and C19 bargeboards and terracotta cross, 2 nave S cusped lancets. Chancel wall projects slightly. E wall has added buttresses and C19 3-light E window. Nave N has 3 cusped lancets and lean-to vestry between first and second. Inside porch is fine C15 ribbed 4-centred vault. Eight panels, hollow-moulded ribs and 4-centred arch each end. Eroded effigy of a knight in niche to left. C19 roofs. Round chancel arch. Medieval, C13, square font scalloped on round base. 1877 fittings include low timber pulpit, pews, iron alter rails by Barrett of Birmingham, chancel encaustic tiles by Webb. E wall brass plaque to John Grant of Waltham Place, d 1804, similar to the one in Roch church. 2 medieval brackets set low, one supporting a displaced medieval stoup. Monument to the Rev. Moses Grant, d 1810, by J. Phillips of Haverfordwest, neo-classical. Carved stone corbel on N wall with three crude heads to front, patterned lines to W and crude animals possibly a hunt, to E. C13 possibly. Included for its medieval fabric especially the fine vaulted S porch and carved medieval corbels. Situated in corner of Nolton churchyard, fronting directly on road. Situated opposite Nolton church in Nolton village. Situated in Nolton Haven village, on hillside S of the bay, set in walled forecourt. Situated about 1 km N of Nolton Haven below the coast road in steep valley just in from the sea-shore.